Perfect Keto: 1 Perfect Keto Base Chocolate Sea Salt, 1 MCT oil powder, and 1 Keto Collagen. Open to US/Canada. Thrive Market: a free 1 year membership + starter kit of your choice (valued at $50 or less). Winner will be randomly drawn on October 10, 2017 contacted and announced on the Healthful Pursuit Instagram channel via an Instagram stories posting. Interview with Jennifer Schmid, chatting about exercise addiction, using keto to change your biochemistry and foster a healthy relationship with the gym, how to navigate your relationship with food when it comes to your children, and so much more. It’s officially been a year since The Keto Diet Podcast premiered, and I can’t believe it. This podcast has given me the opportunity to connect with so many of you, not just the guests, but also the listeners who have helped to shape this podcast by contributing questions and suggesting topics. I can’t even begin to tell you how grateful I am to have this platform to engage and interact with you. It’s only fitting that on the one year anniversary of the first episode, I get a little personal and vulnerable — today’s episode is about eating disorder recovery and exercise addiction, topics that I have experienced firsthand. It was so powerful to connect with someone like Jennifer who shared a similar experience and used keto to help heal her relationship with food and exercise. An eating disorder can make you feel powerless, like there’s no way to ever fully gain control over your body, and it was life changing for both of us to find keto and realize that we didn’t have to control our bodies, we just had to nourish them and love them, love ourselves. I know that sounds simplistic, but for me, that realization was everything. Through keto, we were able to view food as an opportunity to do something good for our bodies, and because the food was so nourishing, we were able to recover bone mass, better mental clarity, and a feeling of hope. That’s why I am so committed to sharing my story, and so grateful that Jennifer shared hers, because everyone struggling deserves to have their hope restored. In today’s podcast, we’re chatting about how to overcome exercise addiction. Today’s interview is with Jennifer Schmid, who has fought for her health and now continues to help other women fight for their health as a nutrition educator. This episode is all about how to identify exercise addiction, how a knowledge of nutrition can be a tool in fighting disordered behaviors, and how to utilize a ketogenic diet can revive and support the body physically and mentally to overcome exercise addiction. Subscribe to my newsletter at healthfulpursuit.com/free to stay current on new products coming soon! 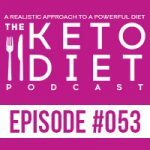 Leanne Vogel: You’re listening to Episode Number 53 of the Keto Diet Podcast. Today we’re chatting about signs you’re addicted to exercise, when to stop working out completely, relationship with food and your children, plus so much more. So stay tuned. Hey, I’m Leanne from HealthfulPursuit.com and this is the Keto Diet Podcast where we’re busting through the restrictive mentality of a traditional ketogenic diet to uncover the life you crave. What’s keto? Keto is a low carb, high fat diet where we’re switching from a sugar burning state to becoming fat burning machines. Hey guys, happy Sunday. The show notes and full transcript for today’s episode can be found at healthfulpursuit.com/podcast/e53. The transcript is added to the post about three to five days following the initial air date of this episode. And let’s hear from one of our awesome partners. If you’re not familiar with Paleovalley, they make two of my very favorite things. The first, a 100% grass-fed and finished fermented beef sticks. Each stick contains one billion probiotic CFUs to benefit the health of your gut and the strength of your immune system. Their gut-friendly sticks are gluten-free, soy-free, dairy-free, GMO-free, freaky chemical, additive, dye, and preservative-free, as well as being 100% free from carbs and sugar. The second, a whole food-based, ultra-primal, super nourishing Organ Complex. It’s a mega nutrient-dense super food supplement. The nutrients in just one daily dose read like the best multivitamin out there, and it’s a whole food. Organ Complex is a combination of beef liver, heart, brain, and kidney all sourced from a hundred percent grass-fed and grass-finished beef organs which are non-GMO and never given antibiotics, steroids, hormones, or grain. The capsules are a hundred percent pure with no fillers or flow agents, gluten, grain, soy, or dairy. Now you can shop all things Paleovalley, load up your cart, and apply a sweet coupon code on everything in your cart. Take advantage of this offer by going to Paleovalley.com/keto20. Fill up your cart and enter the coupon code KETO20, that’s K-E-T-O-2-0 at checkout to apply a 20% off discount on your entire purchase. Unsure of the link? Simply check out the show notes of today’s episode to get all the details. Leanne Vogel: If you have an idea for a podcast episode or want to submit praise over and above your review which you can leave by going to healthfulpursuit.com/review you can reach me at info@ketodietpodcast.com. We have one announcement for you guys and it’s a really exciting one. If you guys remember last week I shared with you that we’re doing a one year podcast anniversary giveaway and you have until October 10th, 2017 to enter to win. All you got to do is review the podcast, e-mail info@ketodietpodcast.com with a screen shot of your review or the user name you used for the review. And you will be entered to win one of two prize packs. The first prize pack is from Perfect Keto, it’s one Perfect Keto base in chocolate sea salt, one MCT oil powder, and one keto collagen, and it’s open to US and Canada. Then there is another prize you can win from Thrive Market, it’s a one year membership for Thrive Market plus a starter kit of your choice. The starter kit is a $50 value and this piece is only open to the US. The winners will be randomly drawn on October 10th 2017, contacted and announced on Instagram live. So good luck and thanks for listening to the podcast and helping me get to one year, woop woop! Today’s guest’s name is Jennifer Schmid. She’s a nutrition educator for Nutritional Weight and Wellness in the Twin Cities and you can hear her on their live podcast Saturday mornings once a month. Jennifer previously struggled with an addiction to exercise and an eating disorder for 20 years and appeared in the PBS NOVA Documentary, Dying to Be Thin that aired in 2000. After changing to a high fat keto style of eating she was able to change her biochemistry, heal her gut, and break the compulsive exercise cycle. 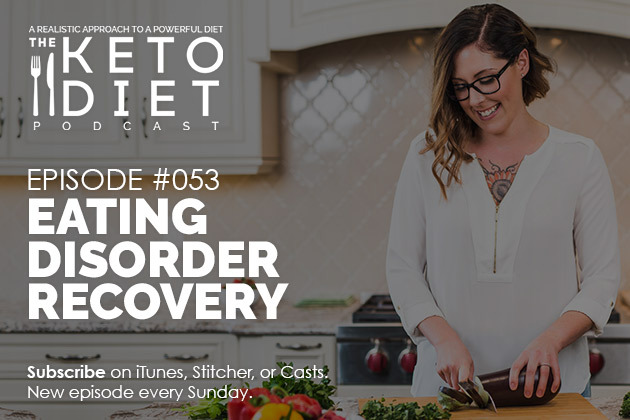 So the original plan for this episode was to talk about ketogenic diets and exercise addiction, but it’s very rare that I get to speak to a fellow eating disorder recovered individual and Jennifer is one of these people. And if you are new to the Healthful Pursuit space, maybe you don’t know but I struggled with an eating disorder for many many years. I had anorexia, bulimia, orthorexia, all diagnosed, all mega struggles. I went to inpatient a couple of times, it didn’t work, I ended up going and doing my own thing and finding coaches and different types of support techniques to get me the care that I felt that I needed. It’s been a couple of years since I’ve been fully, fully recovered and it’s something that I’ve just recently started talking about more openly and there was a very long period of time even when I first started up Healthful Pursuit where I didn’t like to talk about it, it was very secretive and quite shameful, really. I mean how can you trust a nutrition coach that doesn’t even have her stuff together and has an eating disorder? And what I didn’t know at that point is it was very much a psychological thing and not so much anything to do with weakness or willpower. It was very much because I wasn’t feeding myself nutritionally right for my brain, that was a huge piece and something that Jennifer and I talk about quite heavily in this episode, but also that I wasn’t taking the time to really get to know myself and respect myself and understand myself. Like me, Leanne. So recently I’ve started talking about this a lot more because I think that I have a responsibility to do so and I’m hoping that by talking about this more, more people understand eating disorders. It’s not so shameful. And really because I want to be an open book to you guys. And no, I’m not perfect. I’ve struggled with a lot of things and I’m still struggling with stuff. And I think by kind of getting on that same level of just like, stuff happens in life that we don’t totally love and here’s how we deal with it and here is how I dealt with it, can be really powerful for a lot of people. So Jennifer and I talk about a lot of stuff that was very challenging for us and our goal for this, or my goal with sharing this information is that if you see signs in yourself of these things being problems, of these issues and these problematic things that can turn into mega horrible things in your life, or if you notice that maybe a child or maybe you’re a teacher and you see other children in your classroom dealing with these sorts of behaviors, that we can be more mindful of this and catch it before it gets too bad. I think the reason why I didn’t get the care that I needed when I needed it with eating disorder stuff is that my parents didn’t know about it and my family didn’t understand it. And I think the more we chat about it the more we understand, and the more we know, and the more we can action it and provide care to the people that need it. If this is you or you feel like somebody needs some sort of care or support I’ve included links in today’s show notes which you can access by going to healthfulpursuit.com/podcast/e53 on some support techniques and know that although we’re talking about eating disorders it also aligns with disordered eating. You may not have gone to a doctor or inpatient care that says “Yep, you’ve got anorexia,” but you might deal with a lot of issues as it comes to your relationship with food and your body. So know that this conversation isn’t just limited to people that have been diagnosed with an eating disorder. With that said, let’s cut over to this interview. Hey Jennifer, how’s it going today? Jennifer Schmid: I’m doing very well Leanne how are you? Leanne Vogel: I’m so good. And I’m really excited that you’re on the show today with us. Jennifer Schmid: Thank you, I’m excited to be here, too. Leanne Vogel: For listeners that may not be familiar with you, why don’t you start off by telling us a little bit about yourself? Jennifer Schmid: Sure, well my name is Jennifer Schmid, I live in the Twin Cities here in Minnesota, and my full time job, I’m actually a surgical dental assistant but I’m also a nutrition educator with a company called Nutritional Weight and Wellness here in the Twin Cities. So I teach nutrition classes and I also participate in our live radio show on a local station here called Dishing Up Nutrition. We also have a podcast, we have an app as well, so I get to participate in that. Basically my history is, I’ve struggled with digestive health since birth. I was a colicky baby and that was followed by many years of really poor intestinal health. In the late 90’s I developed an exercise addiction which lead to an eating disorder. And I was in and out of hospitals, inpatient residential facilities for so many years and I was even featured in the PBS NOVA Documentary called Dying to Be Thin in the year 2000. And although I was able to restore the weight I was never able to get rid of the exercise addiction, in fact it just got worse as time went on. People are like, “Well how do you develop an exercise addiction?” Well for me exercise did two things. One, it helped ease my digestive distress and two, it helped kid of give me some endorphins. I mean, I didn’t feel normal unless I worked out. I’d say about 12 years ago when our radio show first started Dishing Up Nutrition, I started to listen to that and at first, I was really resistant to change what I was eating because I was eating a lot of sugar, a lot of processed carbohydrates, things like that. But something really resonated with me so I continued to listen and slowly over time, I started to reduce my sugar intake and my gluten intake, but it wasn’t until 2012 after having two emergency intestinal surgeries followed by a diagnosis of osteoporosis and also I stopped absorbing food completely at that time, that I knew I needed life saving help and the doctors were … they didn’t know what to do with me. I went to Nutritional Weight and Wellness and after a month of eating the kind of real foods and balance, I noticed a tremendous change in my health. But what was more exciting than that, Leanne was how quickly my thoughts and behaviors started to change. I’ll never forget, it was a week and a half after meeting with the dietician and I was driving home from work and I thought to myself, and I was on my way to the gym of course and I thought to myself, “You know, I’m not feeling it today.” So I started to drive home and I was just like, just sobbing because this is the first time in 20 some years that I wasn’t going to go to the gym. It was like this fog had been lifted. Like I discovered the most powerful drug on the planet and that was eating real food and after that time, there was so many different changes in my health I started to … my inflammation went down, my back pain went away, and yes, I was able to reverse my osteoporosis within two years, and no dairy wasn’t part of that. And that was just eating real food, and of course, Leanne you know that we need lots of healthy fats for those minerals to adhere to that bone mesh. And so I was able to reverse my osteoporosis and basically I don’t think I would be alive today had I not changed what I was eating. And from that moment on I knew that I wanted to help people who were struggling with what I struggled with. And on top of that, my passion for nutrition has just grown and grown. Leanne Vogel: Wow, what a journey right? I was, I also had an eating disorder for many many years and when I hear, it’s very rare, actually that I get to interact with somebody who’s gone through that as well and is on the other side of it. There aren’t many of us out there because it’s like you know, it’s probably the most challenging thing you’ll ever do as a human. Jennifer Schmid: Oh absolutely. And all the guilt and shame associated with it, too. Just kind of keeps you stuck in that pattern. And to know that it’s actually, you don’t have anything to be guilty about, it’s just biochemical. Not making those neurotransmitters. Leanne Vogel: Yeah and there is quite a shameful thing around it. Like even now when I say I’ve struggled with an eating disorder I’m like, should I bring that up? Leanne Vogel: Weak or anything, but I think it can be said for so many things. Often times we don’t want to show our “weaknesses” and exercise addiction is interesting, very similar to weight loss or eating disorders. It’s almost like as you are awarded and prized for your amazing ability and willpower to go to the gym every day or to lose that weight and have a six pack or whatever the case may be. And it’s not until you’re skin and bones that people are like,”Are you healthy?” But in between that if you don’t look like a skeleton you’re kind of just ignored and praised for these unhealthy behaviors. Leanne Vogel: I know. I know. Jennifer Schmid: After all that time. Jennifer Schmid: Exactly. It’s medicine. It’s either going to heal us or harm us. Leanne Vogel: And so because you had a history of disordered eating and exercise addiction, how did you find keto and how have you made that a positive experience instead of falling into old behaviors? Jennifer Schmid: Right, so I used to be completely fat free and also ate low fat. I can remember after going to the gym in the morning before work I’d stop and get a fat free latte with a fat free muffin and there would be a walnut like a banana pecan something muffin and there’d be a pecan on top and I’d throw away the pecan. Now I would probably throw away the muffin and eat the pecan. So anyway, I first heard you Leanne during Mark Hyman’s Fat Summit in January of 2016. And you really hit something because you’re taking about ketogenic eating for women and I just knew for me, I went from craving sugar all the time to craving fat all the time. So I really had increased just kind of on my own, my body was just saying give me all the fat, I just need more fat. And so I listened and I felt better eating more fat. And so when I listened to you and then you were talking about how as women we do better with the starchier carbohydrates more in the evening. I started to do that and my energy level started to balance out. My adrenal fatigue started going away, my cortisol levels were balancing out. And just felt so much better in my body than eating them throughout the day, just keeping them more towards the evening time made a huge change for me. Leanne Vogel: So it sounds like a lot of it was just also working intuitively with your body and not so much caring about the nitty gritty of things. Jennifer Schmid: Right, there’s no one size fits all. Our bodies are so different and our needs are so different I think. Leanne Vogel: And now you mentioned a little bit but I’d love to chat a little bit more about now that you’re more, eating more fat a little bit, like would you consider yourself ketogenic? Jennifer Schmid: Yeah fat adapted, totally ketogenic. I eat quite a bit of fat. I’d say 70%. Leanne Vogel: Yeah. Overall. And then how have things changed for you since you’ve become keto? Because it sounds like, had you overcome the exercise addiction before starting keto or what was that timeline like and what have you noticed since being keto? Jennifer Schmid: Sure, well when I went to Nutritional Weight and Wellness and changed my eating I was all ready started out about 50%, 45-50% fat, and I noticed pretty much right away that my hypoglycemia went away probably about a month into it. I was hypoglycemic all the time. My moodiness went away, and I wasn’t thinking about food 24/7. Prior to that I mean I was just thinking about food all the time, I dream about food, I’d wake up in the middle of the night and want to eat food. And so it went from that to actually being able to go decent periods of time without eating because I still have a very compromised gut right now. After having all the surgeries and so even my surgeon was saying, “Think milkshake every time you eat, you’ve got to chew that food until it’s nothing because you’ve got a compromised gut.” So I can’t eat like every three hours or even every four hours. Usually the best is at least five hours, just to give my gut a break. So ketogenic has really helped with that so I’m not starving every three, four hours. Leanne Vogel: That’s awesome. And so let’s back track a little bit to exercise addiction because that’s something that I dealt with and the major turning point where I was like, “Oh wow, I think I actually have a problem,” was when I tore, I don’t even remember what it was in my knee. It was really big deal, my knee was really messed up, and I was training for a marathon and it was like my fifth one and the fourth one, the same knee problems that happened I ended up deep water running as training for the entire marathon, and when I hit the pavement it was the first time I had actually been on the road in over three months, I trained completely in the pool. I ran a really good race and I figured, “Okay, so because I ran a really good race I think my knee is fine.” So I started doing brick workouts where I would go on the bike and then I would do a quick core thing and then go into the pool. And there was this one time where my knee was hurting so bad during the bike exercise that I was pushing with my right leg constantly and my left knee was kind of just like not working. It was super inflamed it was getting really puffy and so my coach said, “Tap this one out, go into the change rooms.” What I did is I grabbed a mat, I went on the floor and I worked out for another 45 minutes doing floor work. Leanne Vogel: And that was like, and I remember my coach saying, ‘’Actually go to the change room, get changed go home. Like stop working out.” And I started crying because I couldn’t stop. Like I just, I couldn’t. I was like no I don’t understand, what do you mean? I’m not stopping. So I’m sure you’ve been in that same boat of there’s just not an option. Jennifer Schmid: Oh you better believe it. Yeah it’s not an option. You have to. But your brain is saying I have to. I wake up in the morning I stare at the ceiling and be like, “I don’t know if I can do six hours today at the gym.” Of course I was sacrificing sleep, I would be missing out on family activities, weddings, you name it. I drive through blizzards. Like I can still remember risking my life thinking, “Okay, worst case scenario I stall on the road, I can still walk there in the blizzard, risking my life, but I have to work out I don’t have a choice.” And running my first marathon in 1998 they actually got footage of me finishing and so they used that in that NOVA Documentary I was in. But my next thought after I finished was okay, where is the closest gym to me, because I work out at a gym we have several different locations, because I was going to hit the gym right after because of course that’s what you do after you run a marathon. More of my interview with Jennifer Schmid after this message from one of our podcast partners. Leanne Vogel: Signs that you are addicted to exercise. You chatted about driving through a blizzard, mine was driving on ice, not being able to stop, waking up and forcing yourself to get up. I remember packing my bags, getting my lunch ready, getting my snacks ready, and I would force myself out of bed. It just wasn’t an option. You’re going. Leanne Vogel: Any other signs that you’re addicted to exercise that you can remember struggling with? Jennifer Schmid: Yeah definitely, if you’re sick if you’re injured, after my first intestinal surgery in 2012, January of 2012, I was told not to work out for a month. I waited, I think it was two days, and we’re talking major surgery. I could hardly walk. And I went and sat on a stationary bike and barely got my heart rate up and I was instantly nauseous and I went home and that threw me back of two weeks of healing and within, oh I don’t know 30 days from that, I had adhesions that closed up so I had to go back in and have the surgery done all over again. And I’m sure that going to the gym didn’t help that. Also I think if you, you’ve got to ask yourself why. And if you don’t enjoy the work out while you’re doing it that’s a sign, too. I hate running on a treadmill so I’m going to go run on a treadmill. Well I think you should do something you enjoy and not force yourself to do something that you don’t want to do, and if you are doing something that you don’t want to do again that’s a sign. Leanne Vogel: Yeah, and I think also for me I actually thought that I really loved running, biking, and swimming. I actually thought that I did. And now, I don’t think, maybe you could pay me like a million dollars and perhaps I would run a 5k. Like I just, I really dislike running, I don’t like it. I don’t like running, I don’t like swimming, I really don’t like biking. But I did it because that’s what I did. And yeah, now I really love walking. I love walking and I love yoga and I love dancing. It’s like creative and my body feels good. I think you don’t know that you actually don’t like it until you kind of step away from the addictive mentality because you think that you love it when you actually don’t. Jennifer Schmid: Exactly, and those are my go-to’s, too. I love walking, hiking, I do like to bike outdoors as well but big into dancing now, huge into yoga, and that’s really helped with my adrenals. I can fall asleep now in savasana in like two seconds which I could never have done that before. So yeah I only, my thing is I only do things I enjoy and if I worked a 12 hour day at work and I’m tired, my body says I’m tired I listen and I go home and I just don’t go. Leanne Vogel: Yeah and that’s not even something you could have like, it just wasn’t even on the table as an option. Jennifer Schmid: Yeah, exactly. Well yeah I mean it’s, you know you’re risking your life to do something that is also killing you at the same time. So when you’re risking your life or you’re lying to people you love to do something I mean that’s a sign you’re addicted. So if I could go back and tell myself I would say, “Honey you’re sick and you need to turn around and go home or call someone,” and I would have definitely been more, because I had been listening to this radio show for I don’t know at that point it was maybe nine years or so. I would have made an appointment with a nutritionist sooner, but I didn’t know at that time if it would help my addiction. I just never imagined my brain chemistry could change. Leanne Vogel: Yeah I think it’s like, when to know when to ask for help and being real with yourself is a really big thing and sometimes it’s a matter of maybe just stop working out, find something that you enjoy that’s more movement based or find help. I’ll include some links in the show notes of some people that I’ve used in the past as coaches and consultants. Do you have any recommendations of resources that people can use when it comes to these sorts of things? Jennifer Schmid: Well I guess the first thought would be you. Leanne Vogel: Oh yay, thanks. Jennifer Schmid: Yeah, otherwise yeah the company I work for, Nutritional Weight and Wellness has helped many people like myself, and yeah. Leanne Vogel: Okay deal. And I want to chat a little bit about, like for me and my exercise addiction, I actually had to stop exercising completely. Like no nothing. I allowed myself to go on a 20 minute walk when I felt like it going at a slow pace and I wasn’t allowed to brisk because then all of a sudden I’m running again. Leanne Vogel: What have you seen in your work or with yourself, was there a period where you actually had to stop working out completely? Jennifer Schmid: Just had to like you, just walks. I would only allow myself to walk and the dietician I work with was like, “I want you to cut back to an hour a a day,” and I looked at her in our first meeting and I said, “Well an hour a day, don’t you think I should cut it more down than that?” Like I was expecting her to say don’t work out at all. She was like, “Well I’m just trying to ease you off, just being realistic.” So then once my brain chemistry kind of changed and that day I didn’t go at all, from there on out it was like okay, we’re just walking. We’re walking, doing yoga, and just totally listening to my body. And what was really exciting was because I had gained weight so many times in treatments and when I gained weight by eating a lot more fat and animal protein and lots of vegetables, I would get out of the bed in the morning and I wouldn’t appear like I restored weight, but my legs would be heavier. Like I was gaining bone mass. That was really exciting to me like, “Wow, this is so different than when I restored weight in the past. Like I’m actually gaining muscle and bone this is so exciting.” So that made a huge difference. Leanne Vogel: Did you deal with fear when it came to that? Like was that process scary? Jennifer Schmid: It wasn’t actually. I had never dealt with, except for when I was an adolescent like 12, 13 years old. I’m a twin and my twin sister was always very very skinny and I was always kind of, a little bit overweight, and so I would be very insecure about that. But then when I got into high school, I joined sports and I leaned right out, so I never had that issue of, that desire to lose weight. When I was going through the most of my exercise addiction I would be ashamed of how thin I appeared and I’d want to hide and I’d want to put on big baggy clothes to make myself appear bigger. So actually the weight restoration process was really exciting for me. Because every day I looked in the mirror and I would look better and better and I thought oh my gosh I’m looking more like a woman in her late 30’s should look and not like a 12 year old boy. Leanne Vogel: Amazing that that process for you seemed natural. I know for me that was probably the hardest part to all of it was weight gain. And now looking at the scale, in fact it’s so cool. I jumped on the scale for the first time in over two years today. This morning. I rented a hotel room to record a bunch of podcasts and there was a scale in there and I’m like, “That’s interesting, I’m kind of curious. I’m just going to jump on there and see what happens.” And I always love kind of dancing on the edge of having to deal with emotions that come up because jumping on a scale it’s like oh dear gosh this could be really bad what are you thinking? But I jumped on the scale, and I was really surprised by the number. I also don’t care, but the difference of what I weigh now and what I weighed when I was like my goal weight, I can’t breathe or think about anything, I just have to focus on working out and counting my macros, 12 pounds. Really? 12 pounds. That’s like a bag of large potatoes. I’m like, and the fact that those 12 pounds completely dictated, like you were saying lying to family members, missing out on activities. I used to run on the spot to try to get some calories down. This obsessive compulsive thing, and it was 12 pounds. 12 pounds, and your conversation about bone mass and my bones were also very very very bad. I’ve had a lot of those different DEXA scans and things and they were saying, “Your bones are bad.” Those 12 pounds are like, muscles that I didn’t have before and strength I never had before and bone density that I did not have before, and it’s just not worth it. Jennifer Schmid: It’s not, and that’s why I think really no one should go by the scale. Go by how your clothes fit. If you’re afraid you’re losing weight, if your clothes are loose you’re losing weight, you need to gain the weight. If your clothes are tight then you need to address that if you want to. But I think go by how your clothes fit, don’t go by what that number says because my brain was shrinking. I believe when you’re malnourished and your body goes into starvation mode you start to, that inner cannibalism starts to happen. And what’s the first organ it goes after, I discovered was the intestines. Well what a shocker I had three intestinal surgeries. Leanne Vogel: I had no idea. Jennifer Schmid: Yeah so that’s why my intestines detached from my abdominal wall because that tissue is just gone and it twisted up like a fishing line, my large and small intestine. And of course they had to sacrifice my ileocecal valve which prevents bad bacteria, or the bacteria from your large intestine from going into the small intestine. So I pretty much have chronic SIBO, which there again, eating this way has really helped with that. So yeah. Leanne Vogel: That’s amazing. And just it’s so nice to just have a conversation with somebody that understands their body and appreciates their body and I had no idea about it attacking the intestinal track first which makes total sense. I remember when I first met my husband 10 years ago I was very sick and still in major need of help. And I would always deal with stomach pains and these knots in my intestines and I could never get rid of them. It didn’t matter what I ate and now, I mean my digestion is pretty on point. I don’t really have to worry about it and it really comes from a nourished perspective. Leanne Vogel: And just like taking care of your body. Jennifer Schmid: And I don’t know, did you ever do a hospitalization inpatient hospitalization? Leanne Vogel: Yes I did two of them. Leanne Vogel: And it was the worst. Jennifer Schmid: Yeah it is the worst and the food is terrible and it’s not good gut healing food. And so basically the food that I ate was mostly sugar and processed food and would just harm my intestines further, and then you were timed when you ate so you had to eat said food as fast as you can and you weren’t chewing properly. It just set up a whole slew of problems for the gut and that’s why my passion, and I have gone to different eating disorder clinics and told my story and spoke with the dietitians and said, “We gotta do something here, instead of breakfast cereal with mandatory sugar packets and skim milk, we need to do healing food.” And I had one dietician that was really on board and then suddenly he wasn’t working there anymore. So I was like, I still want to see that happen. A clinic opening up just to support just healing good foods with lots of good healthy fats, not margarine. Good healthy fats and good protein and lots of vegetables just lot of bone broth to heal the gut. I think that would make such a difference. I really do. Leanne Vogel: It is, it’s so true. I know when I went to inpatient they asked me what allergies I had and I’m anaphylactic to peanuts so I wasn’t forced to eat that, but they basically said, “You’re not sensitive to gluten, you can have dairy, we don’t care these are just rules.” And when you eat food that doesn’t align with your body, like actually, you’re being told to eat these things that you don’t understand. You’re right, really where those sorts of programs fail and why I ended up moving out of my house at 16 because my parents were sort of like, “Go to treatment or leave.” And I’m like, “Bye. I can’t do this.” And it’s really like, I needed to understand the meaning behind the food. And that’s why I studied nutrition because I was like, this food is doing something and food can heal me but nobody’s really telling me what that is so I’m just going to go to school and figure it out myself. And that’s how Healthful Pursuit was created was just I don’t understand why this broccoli is better for me than that chocolate bar. Like I just don’t get it, what is the point, why do I even need to eat? And once I understood that bone broth was beneficial and that soda is not going to be helpful and these were the things that I totally agree they give me seven sugar packets and I had to add that to my ensure milkshake thing. Leanne Vogel: More of my interview with Jennifer Schmid after this message from one of our podcast partners. Instead of the regular almond or coconut flour, their mixes are made with ground sunflower seeds. I know, it’s crazy and it’s also absolutely completely ridiculously delicious. 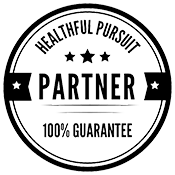 Use the coupon code KETO, that’s all in caps, no spaces, for 20% off your order at healthfulpursuit.com/mix. If you’re unsure of the link, simply check out the show notes of today’s episode to get all of the details. Leanne Vogel: So I’m assuming that there are a lot of parents listening that might have teenagers or children that might be struggling with some sort of disordered things. Like I actually overheard a conversation on a train recently. The girls were probably 12 years old talking about diets and just I had to interject and tell them a couple of things, I don’t know if they listened whatever. Jennifer Schmid: Good for you for doing it though. Leanne Vogel: It’s just painful. It’s painful to listen to, I just can’t sit by and watch this stuff happen, so what advice do you have to parents that are watching their children grow up in a world that’s even more screwed up than we were kids? Jennifer Schmid: Yes, just have a conversation with them. Talk to them about their relationship with food. Encourage them to eat lots of healthy fats and animal protein and vegetables, and just check in with them and see how they’re doing. It’s hard with social media especially, thankfully I didn’t have that in my teenage years, I’m 42, but I know that’s a huge problem. That just feeds so many different disorders. But really just to check in and get the information and support them and don’t force them into anything. I think when it comes to treatment, when you’re forced into treatment and you’re not there on your own will, you’re really not going to be successful unfortunately. Leanne Vogel: Yes. I can agree to that. 100%. So did you end up overcoming a lot of disordered behaviors while at treatment? Or did you find that external sources like different coaches and things like that helped more? Jennifer Schmid: I would say externally. In treatment, it was just like, I just felt shame and guilt you’re watched whatever you do, I just said all the right things in therapy to try to get out as soon as I could because I didn’t want to lose my job at the time. And money was dwindling and I wasn’t making money while I was in there. So I’m like I have to just do what they tell me, say what I need to say, just to get out. I did learn some mindfulness things. I did learn, actually in a residential facility I was at in 2005 I believe, we had yoga and that was my first introduction to yoga. That was huge, that helped me out a lot. But aside from that the food point just, that just wasn’t helpful. Leanne Vogel: Yeah I think it was always my dream, especially while I was recovering and using yoga that it would be so cool to have a center for disordered eating. Not just eating disorders but disordered eating where yoga was practiced and there was cooking classes with nourishing foods and while you’re cooking you’re learning about how these foods impact your body and how beneficial they are. That stuff is so much more powerful than sit down, you have 10 minutes to drink seven sugar packets and a cinnamon bun. Jennifer Schmid: Yes exactly, and you’ve got to inhale that and it’s just going to harm your gut. They just pass the Miralax around, I don’t know if they did that where you’re at. Jennifer Schmid: Yep. So it just is not helpful. But yeah I think your idea with the yoga and the nourishing food, absolutely. That’s my dream, too, is just to see a holistic approach and educating people. Getting to the root cause like I got to discover what my root cause was. An unhealthy gut, not eating enough animal protein, not eating enough fats, and once I was able to start healing my body and repopulating those neurotransmitters was like, oh okay. It just, that’s why I just want to tell my story and help people. Leanne Vogel: Yeah I think there’s something to be said too about fats and the benefit of brain function as somebody who was diagnosed with ADHD I was 11 and then the eating disorder stuff kind of happened pretty much around that time as well and I wasn’t thinking correctly and it wasn’t until I ate keto for the first 30 days where I was able to go off my medication for the ADHD and that was like, whoa. I wasn’t used to having a brain, actually. Jennifer Schmid: Exactly. It’s like you can start to remember things and retain information and be completely focused on what you’re doing. It’s amazing I went through the same thing. Leanne Vogel: That’s so cool. And so getting back to parents and signs. What are maybe some signs that perhaps their children or maybe even themselves are dealing with disordered patterns when it comes to … let’s focus on eating because we all ready talked about addicted exercise stuff. So what are some signs and symptoms of disordered eating tendencies maybe? Jennifer Schmid: Feeling just a fear of any type of food. And I’m not talking a food they’re intolerant to or allergic to, but a certain type of food they’re afraid to eat, like let’s say bananas because some people are afraid, there’s just too much sugar in a banana. I get that, but if they’re completely, they can’t go near a banana that’s a sign if they’re completely afraid of eating a certain food or they don’t want to participate in an event because they’re afraid to eat the food there. Or just an irrational fear, just an irrational fear around a specific food. Or maybe patterns like I had was I ate a certain food, like I had this almost obsessive compulsive certain way of eating like I would eat at this specific time and I’d eat this certain food on this day at that time but I couldn’t eat anything else with that food. So that’s something that I went through. Leanne Vogel: Yeah I would have to say the rules were definitely a big piece to me even though I thought that I had overcome disordered eating and I wasn’t binging, purging, I wasn’t restricting food like anorexic stuff. But it was still like, I ate this at this time and this at that time and this with this but not with that. My question for you is what were some of the most powerful things you did, like we chat a little bit about yoga and whole foods to heal your relationship with food? I was so much more intuitive with my body and I just started to see food instead of fearing certain foods, just seeing food as such a miracle for my body. Leanne Vogel: That’s amazing. I love it. And given your history and everything and we’ve chatted about a lot of it, what is your keto look like right now and how have you learnt about your body during the keto process and how have you adjusted things for yourself as a result? Jennifer Schmid: Okay so I learned, because in the beginning I was eating three meals, three snacks a day. And although I was able to gain the weight and I felt pretty good, my gut was still like, “Ugh, I need a break. I can’t, I just need a break.” So for me it was I needed to space things out more, and so then I started doing more healthy fats to extend that so my blood sugars wouldn’t be dropping. So then it became like eating three meals and one to two snacks a day. And then after listening to you, Leanne I started to change and just doing that, starchier carbohydrates or sweet potato or squash or apples or whatever kind of towards the evening time and that started to really balance out my body. So I can’t, unless I’m forced to at work, I tend not to go anymore than, except for sleep, maybe 10 hours without eating. But during the day I’d say the longest stretch would be usually about maybe seven hours and that’s just because of my job, it’s very hard to take breaks but then I just do keto milkshakes or something and that really helps. But yeah that’s, now I’m to the point where my gut is happy, my brain is happy and I’m just not ruminating and thinking about food all the time. Leanne Vogel: Which is amazing. And did you ever think you would be in that space? Jennifer Schmid: No absolutely not. Leanne Vogel: Yeah that’s pretty amazing. I love it. And where can people find more about you from you? Leanne Vogel: Yeah it can be challenging. Jennifer Schmid: It’s just a lot of time. Leanne Vogel: Yeah. You just gotta pick one and roll with it otherwise you’ll be on social media all the time and get nothing done. Leanne Vogel: Well thank you so much for being on the show today Jennifer I really really appreciate it. Leanne Vogel: And thanks for being really open because I know sometimes these sorts of conversations where we’re really opening up and chatting about stuff, it’s hard to dig deep into that stuff so I really appreciate you opening up and sharing your story. Jennifer Schmid: Thank you for the opportunity Leanne. Leanne Vogel: Yeah you bet, and take care, thank you. Jennifer Schmid: You too, thank you. Leanne Vogel: That does it for another episode of The Keto Diet Podcast. Thanks for listening in. You can follow me on Instagram by searching Healthful Pursuit, where you’ll find daily keto eats and other fun things. And check out all of my keto supportive programs, bundles, guides, and other cool things over at HealthfulPursuit.com/shop, and I’ll see you next Sunday. Bye.